Animal rescue worker Iris Mallery thinks she has created a stable and secure home for herself, but when her small town is battered by an earthquake, Iris needs to rebuild not only her own life, but the lives of the displaced dogs and cats now filling her shelter. The quake’s effects are personal for Iris, but not for seismologist Casey Radnor. Casey is a scientist above all else, logical and disconnected from the natural disasters she studies. 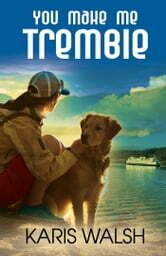 When she rescues a stray dog from some rubble, she finds herself caught up in the lives of Iris and the others affected by the quake, despite her best efforts to remain professional. The beautiful San Juan Islands in Washington State become the epicenter of both the earthquake and the collision of Iris's and Casey’s hearts. Can love bind the shattered fragments together again? Two women meet on the ferry and are attracted to one another but clash before the ferry docks. Iris O’Malley, animal rescuer, is a resident on the island that Casey Radnor, seismologist, has been sent to study after an earthquake has hit the area. With one thing leading to another the two spend quite a bit of the time Casey is on the island clashing, sharing and caring. They find they have much in common in some ways but that they are quite different in others. The main dilemma is trust and whether or not there is a way for them to meet their professional needs while moving forward together. I like animals so loved the many animals shared in this story. I enjoyed learning more about the San Juan Islands, seismology and even a bit about creating greeting cards. This is my first book by this author but doubt it will be my last. In some ways I can see this as the first book in a series that would star the residents of Friday Harbor. Thank you to NetGalley and Bold Strokes Books, Inc. for the ARC – This is my honest review.